@Scott-G Are you going to make any available for sale? Say Tindie? That is an awesome project. I use a lot of Ubiquity gear, and they have a non standard 24V PoE. Would the circuitry still work with 24V instead of 48V? I would be interested in this if it supported 24V PoE. Really interesting! Are the schematics available? I’ll take a further look at what you’ve provided when I get a chance. 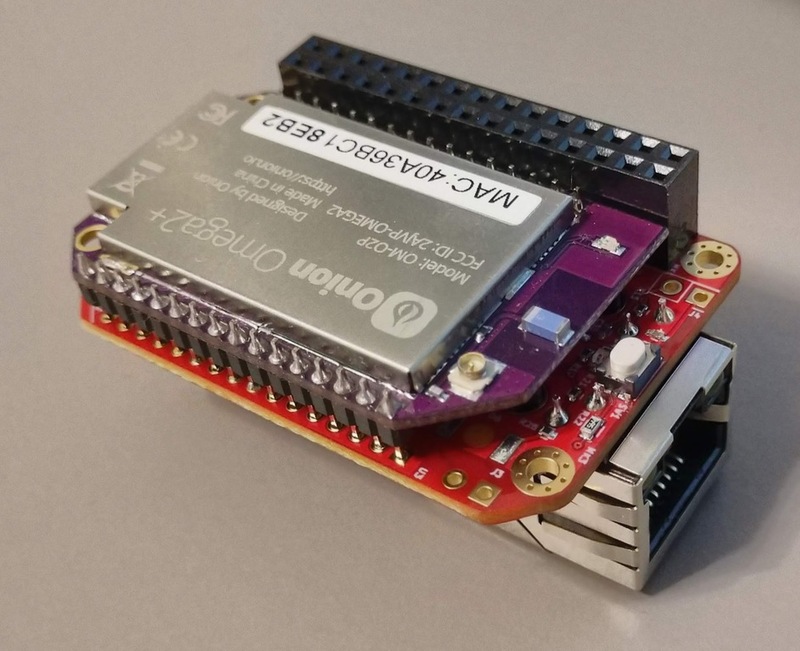 Are you passing through the Ethernet PHY from the Onion itself, or is this actually a second Ethernet interface itself as well? Ah yes, Ubiquity! There's a company who's too cool to follow standards! Don't get me wrong, I'm sure they have their reasons, and some of their gear will operate on 24V non-standard PoE and/or 48V standard PoE. I'm pretty sure it can be made to work for 24V, although the design might need some tweaking to make everything happy. In the very least, the under-voltage lock-out is set to 35 V, so at least one resistor would have to be swapped out. There might be more complications where we have to do something special to tell the IC that it's not in 802.3af negotiation mode, but I'll test it here when I get my first boards. @Freddy-Franco I usually try to run off a PDF schematic, but I forgot. Here they are now. There's a board top-layer PDF in there too, but it's a mess to look at. Sometimes there's no substitute for opening the board layout in KiCad. This does mean that the Ethernet expansion board won't work, but, well, I think that's fair. The four Ethernet pins on the expansion header have been replaced with four spare IOs instead. I'm very interested in this. I have current generation Ubiquiti UniFi gear which is 802.3af/at compliant. If it works with that, I would possibly buy several of these. Really cool! This was a feature i was asked a lot for my dock\new, but i've never implemented it. I'll be more than happy to link this project. BTW i can't open the project in my kicad version. Are you on a nightly build? @valerionew I'm running Kicad out of an Ubuntu repository, 201801141617+0ee38bc~61~ubuntu17.0. Sorry that it's caused headaches - if you really care, I can try to get it running in a real released version. 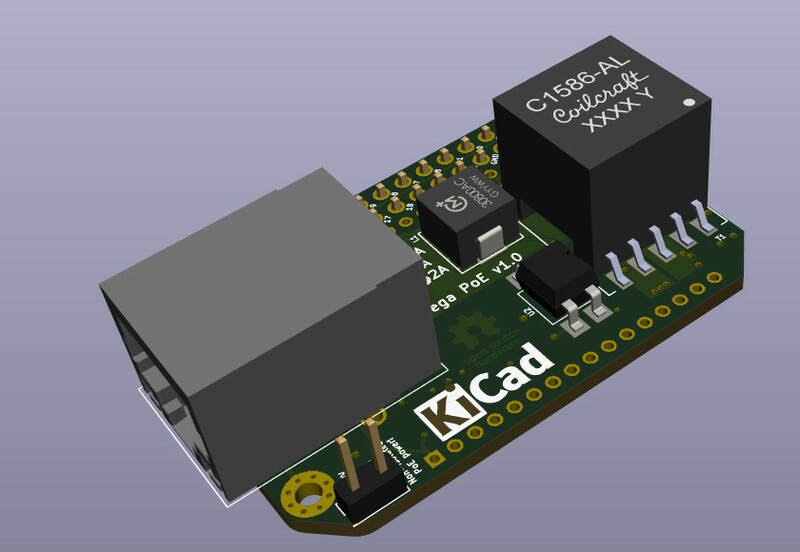 I think there's some turmoil as they prep for the KiCad 5.0 release. I'm holding off on submitting schematic and footprint library changes until that's all done, for example. This is great! 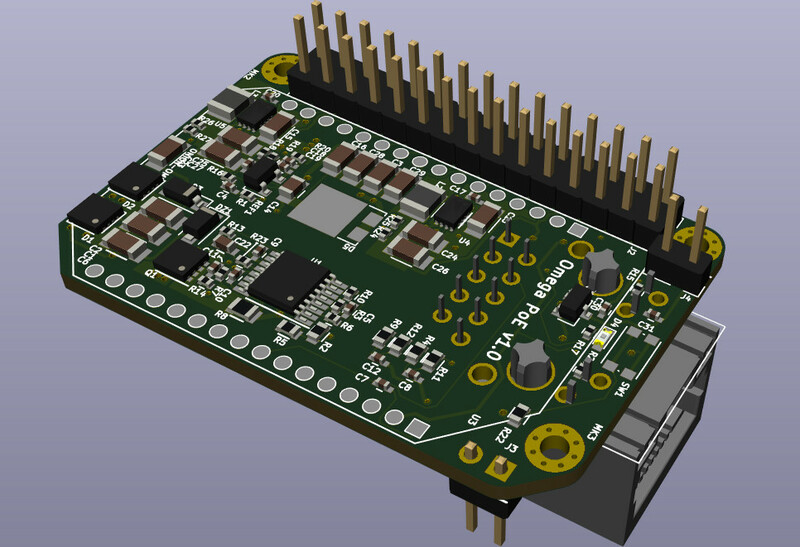 I have a dream about making a dock with PoE and the GSM-modem but understanding KiCad is my biggest hurdle! But this card looks great, i so want one! :) Great work! Can you elaborate at all on your ethernet magjack LEDs? Am I correct to assume that they're functioning properly for 'link' and 'data'? How is that set up & configured on the Onion? @Scott-G Thanks for the feedback. I'd love to have the LEDs tied deep in to the kernel for 'link' and 'data' but I agree it'd be a lot of work. Neat project, thanks for sharing. The boards are working great! The 12V output works for running ~12 watts of strip LED, and the Omega can control it as expected. The 5V and 3.3V lines look great, even with some load, and the Omega's running without any issues. The whole thing is even pretty efficient - with a strip of LEDs, the Omega is putting out more heat than the converter. There was a bit of a hiccup where I failed to recalculate a resistor value when I scaled the design from 3.3V output to 12V output. That was throwing the compensation loop out of whack, causing the 16 KHz ringing. After a bit of learning about feedback compensation and some circuit modeling, I calculated the correct value, and it's much happier now - no more audible whine, no more 16 KHz ripple in the 12V line. I'm now willing to declare that this design works! I've even fixed the rest of my boards. Aside from the first one, which gave it's life for that resistor value fix, the other three work great. I've soldered the Omega down to my boards, but it should also be possible to put 2mm headers under them. Digikey is currently out of stock of the headers that are known to work, but I have some alternatives coming in a few days. The headers are only a few bucks, and only add ~4mmm of height. How many people would prefer to solder their Omega's down permanently? There's always going to be some ripple in the 12V line when it's under full 15W load - how much ripple is acceptable to you? I'm aiming for <150 mV, but I'm going to have to add a capacitor to get that. Am I the only one who cares? I might just leave an unpopulated pad for people to add a capacitor if they need it. I have the 12V output header controlled by a MOSFET, controlled by a GPIO. That GPIO, however, floats on startup, causing the 12V output header to be unpredictable. I want to add a resistor to hold it either high or low during power-up. So, 12V on by default, or off? If I run a group buy of these, how many are people interested in? They get cheaper the more that I order at once. $100 for 1, $78 for 4, $65@10, $60@40, $45@100 (approximate)... What kind of price range would people be interested in? How many? P.S. : If anyone who works for Onion is reading, and wants to order and sell these so that I don't have to, that would be great! I'd love for my design to be the official PoE dock, and I wouldn't mind avoiding the trouble of running a group buy.